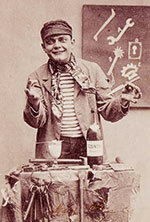 Born Lawrence Desmedt in Cornwall-on-Hudson near West Point, New York, Larry grew up in a rural community. His father was a maintenance supervisor at West Point Academy: by some accounts he was authoritarian and prone to violence. Not surprisingly Larry rebelled with a vengeance: by 18 he reportedly had 35 arrests ranging from his home state of New York to Oklahoma and California. 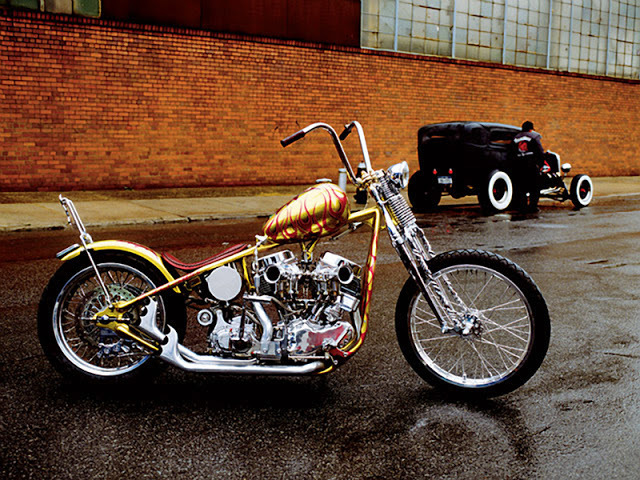 According to an interview in Rolling Stone Magazine his first bike was a 1939 Harley Knucklehead he bought for $200. Within hours he had taken it apart; it took him nine months to put it back together. Larry hung out with a rough crowd and was continually finding himself on the wrong side of the law: he got involved with drugs, armed robberies and hijacking trucks, and at one point led a car chase through several states pursued by a police helicopter. 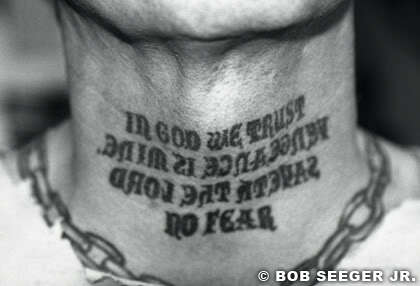 Arrested some 35 times he built up rap sheets in Oklahoma, California, New Jersey and New York. 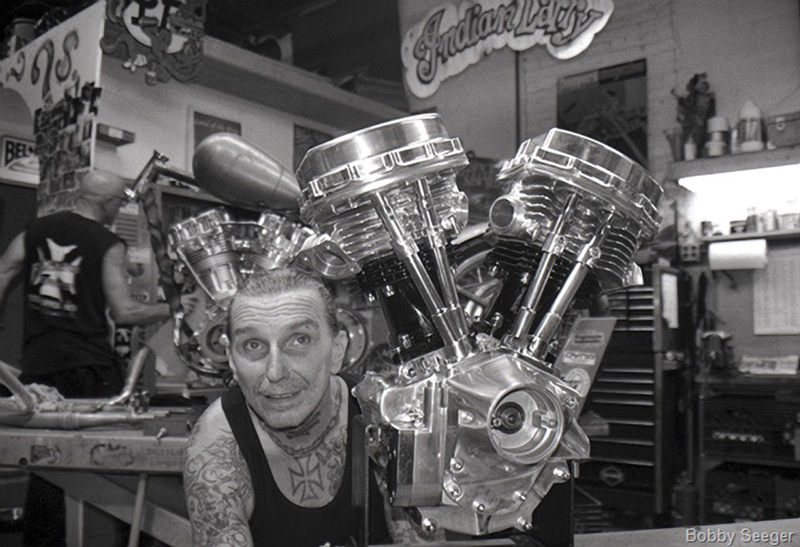 Larry immersed himself in the California hot rod culture, working for various builders and painters but at the same time he was developing drug addictions which would haunt him for years. In 1971 Diane was murdered, and Larry returned to New York with her body. The tragedy drove him deeper into drug abuse, and returning to –or by some accounts continuing- the old lifestyle he began robbing local stores in order to support his habit. In 1973 he attempted a bank robbery but an accomplice had tipped the police beforehand: Larry came out of the bank with a shotgun in one hand and a bag of money in the other and two cops opened fire on him. After a brief recovery from a gunshot wound, he was sent up for 3 years in New York’s Sing Sing State Prison. While doing time he read assiduously, earning a GED and eventually even pursuing some college-level studies: he maintained a reading regimen throughout his life. Released on parole in 1976, Larry moved to Manhattan and began making a name for himself at various custom shops as well as the New York art world, befriending photographers Robert Mapplethorpe and Andy Warhol. 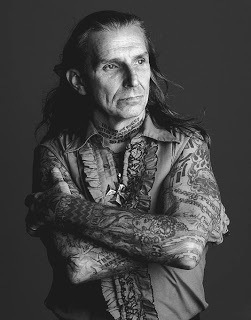 Through the remainder ’70s and ’80s he frequently did modeling gigs and stunt work for Hollywood. 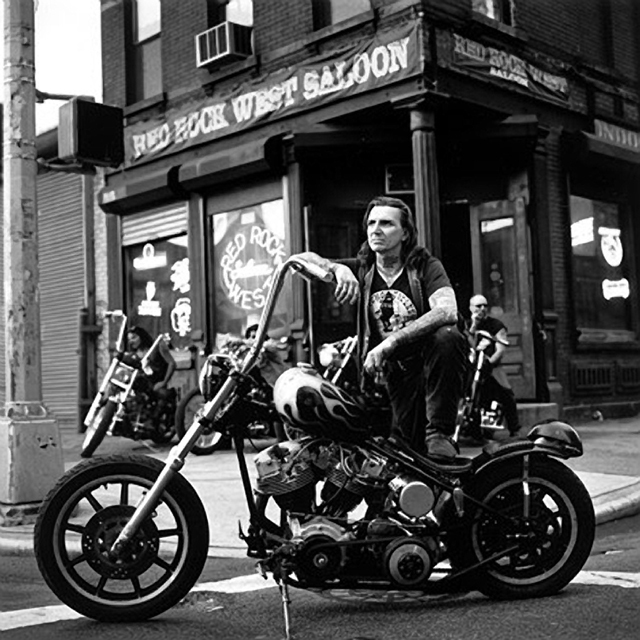 During this time he was riding a chopped Indian motorcycle and picked up the moniker Indian Larry, but he still battled on and off with his addiction. In this new guise he cultivated a growing number of fans, perhaps building on Roth’s attitude that fame meant business, and business facilitated art. 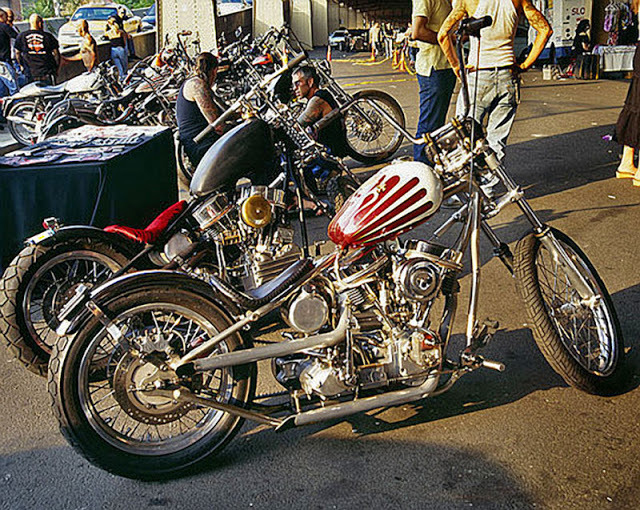 The extended front end “chopper” movement which prevailed through the ’60s wasn’t his style, and he stuck with an old school approach with a preference towards customized rigid frames, low slung seats, apehanger bars and panhead / shovelhead engines. But pulling from Roth, his paint jobs still tended towards flash: candy and metalflake abound, along with heavy tank and primary graphics. 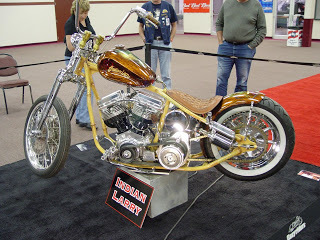 He also developed the art of custom sculpted frames, applying blacksmithing techniques to the steel. 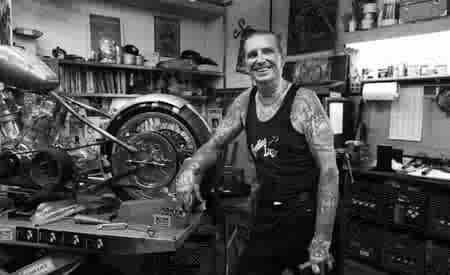 In 1991 he finally opened his own shop, Gasoline Alley in Brooklyn. 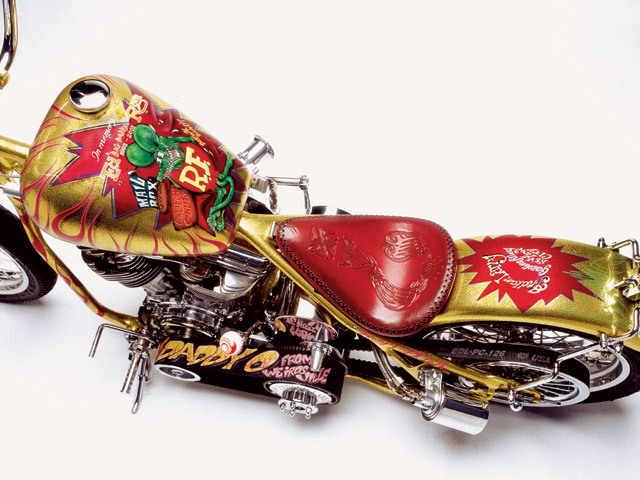 He landed the cover of the February ’98 edition of Easyriders Magazine and in September ’98 they ran a full color feature on the Grease Monkey, a that bike would go on to win the editor’s choice award at the Easyriders Invitational Bike show. He had finally made it. 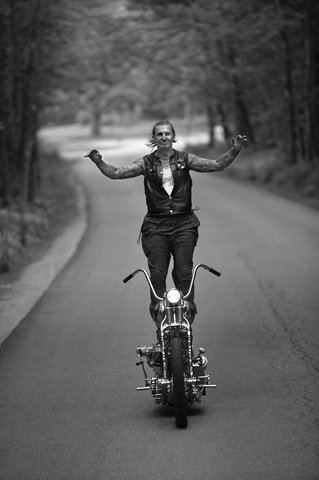 In 2003 the Discovery Channel recruited him for a show called Motorcycle Mania II where he performed his Crucifix stunt, which was an instant hit. Riding on the success of Motorcycle Mania and other custom bike related reality shows, the channel began the Great Biker Build-off series, featuring two different builders with opposing styles in a timed competition after which they would ride the bikes across the country to a staged event where participants could vote on the winning design. For their third episode Indian Larry was chosen to go up against Paul Yaffe: Larry won the competition and the popular series cemented his place in the top of the custom bike world. 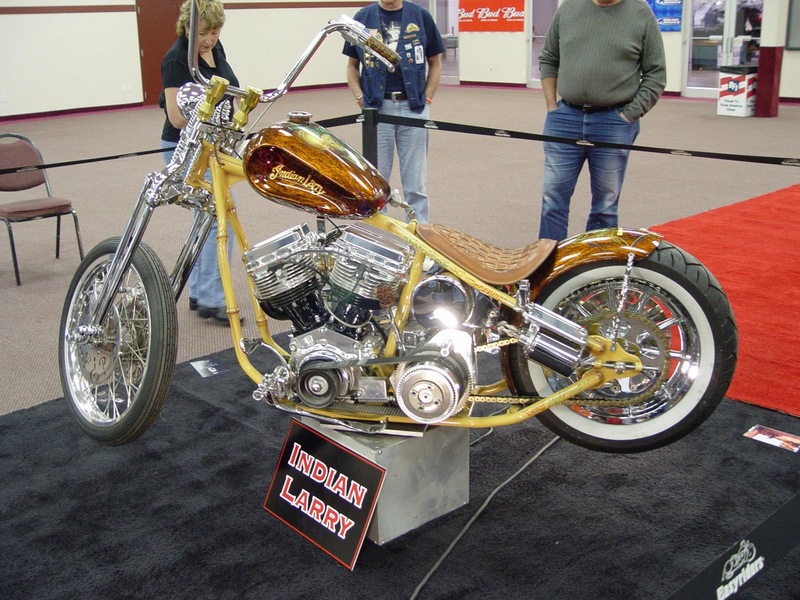 The next episode featured Larry paired against Billy Lane of Choppers, Inc of Melbourne, Florida. Larry again won the competition by a narrow margin: In true form he took the microphone and said, “There are no winners, there are no losers!” and proceeded to dismantle the trophy, giving part to Lane and autographing other pieces which he handed out to the crowd. A third episode was filmed in August 2004 featuring Larry against Mondo Pouras of Las Vegas. 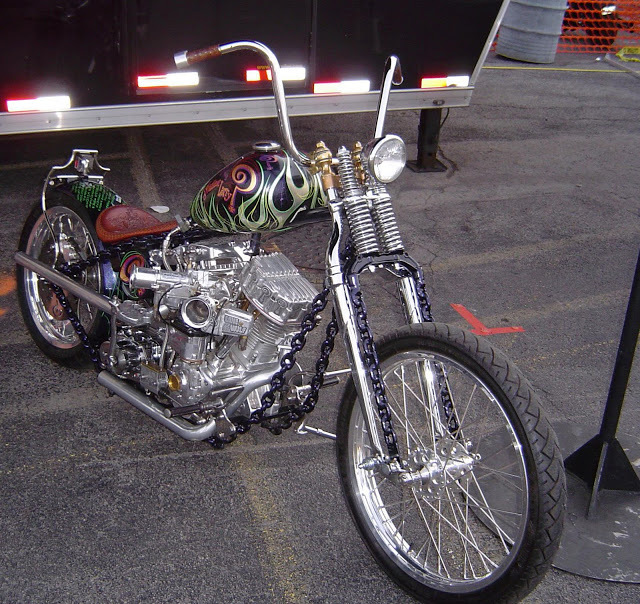 Larry built The Chain of Mystery for the show, featuring a custom frame created from welded steel chain. 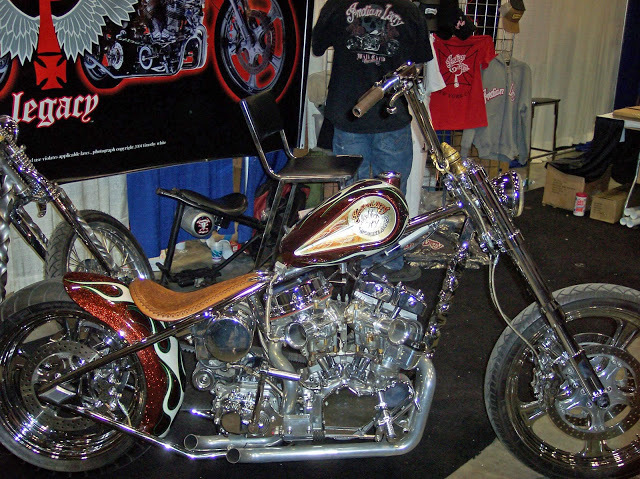 Larry and Mondo rode from NYC to the Liquid Steel show in Charlotte, NC. On Saturday August 28, 2004 he was performing stunts in front of a crowd of some 8000 fans: after riding through a ring of fire on his bike, he got on the Grease Monkey for his signature Crucifixion stunt. 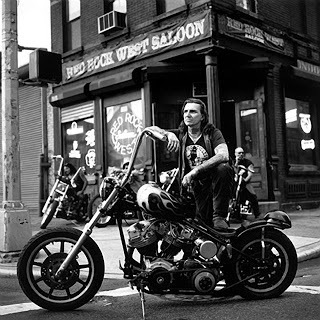 Notably there was no throttle lock on that particular bike, which he must have known would cause a rapid deceleration once he released the bars: he stood up on the seat and surfed the bike down the track but it quickly started to wobble and Larry was thrown. He jumped off before the bike fell over, but still struck his head; he was going too fast to hit the ground running. He was airlifted to the hospital and died on August 30 of head injuries. Awesome stuff here thanx for the shares. 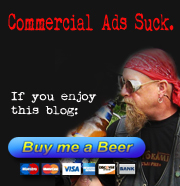 its the first time ive seen your blog, it’s very cool.